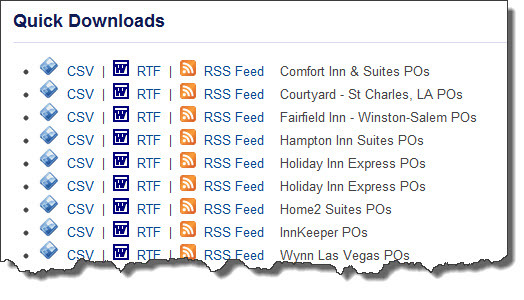 Need to supply an RSS feed or an Excel export to your users? Now you can create customized data feeds within XMod Pro! Module Description: The Feeds feature of XMod Pro allows you to create RSS Feeds and File Exports from your data. As an example to show off the flexibility of the Feeds we have put together a "Starter Kit" which provides examples and starter code for many popular file formats. Uses: You can create many popular file formats with the Feeds feature! The defaults allow for CSV, XML and Custom, and from the custom you can build in a text list output. Because Feeds are rendered outside of the main DNN page structure, you are also able to use it for any page or content that needs to have no skin and no DNN framework in the code! Use Feeds to create a "Quick Downloads" report module for your dashboard pages, allow users to subscribe to RSS feeds for frequently changing data from your DotNetNuke site, build the type of exports and reports you've always wanted! Output so many file types CSV, XLS, RTF, TXT, HTM, XML, RSS, ASX, WSX, RAM, M3U, more! The most basic and universal export type, having a CSV export for your DNN and custom data records can be invaluable. CSV is a delimited data format that has fields/columns separated by the comma character and records/rows terminated by line breaks. Variations on formatting can include changes to have tab or pipe "|" separated lists as well as internal formatting for single quote encased values. This demo feed shows how to use the xmod:Format tag to remove linebreaks from data to remove accidental line breaks from text content. One of the more commonly requested data file exports for modules and DotNetNuke sites, the Microsoft Excel XLS file is the go-to spreadsheet format. This XMod Pro Feed produces a table-based XLS file that, while it contains an easy-to-read html table structure for content and formatting, it does alert the user when opening in Excel that, "the file extension is in a different format, only open if from a trusted source." Once opened in Excel, it functions as a standard XLS file complete with functions and formatting. One of the more commonly requested data file exports for modules and DotNetNuke sites, the Microsoft Excel XLS file is the go-to spreadsheet format. This XMod Pro Feed produces an XML-based XLS file (which keeps it's .xml file extension, however displays XLS icon by default). This Feed contains more complex XML formatting and structure and robust features for functions and display formatting. It opens perfectly with no user alert. Capabile of being opened and viewed in many word processing and document applications, the RTF Rich Text Format is a more universal, cross-application text file. This XMod Pro Feed produces an XML-based RTF file which has rich formatting for fonts, colors, page breaks and more. One of the more commonly requested file exports for websites, this XMod Pro Feed format allows you to create a Microsoft Word DOC file in XML-based code. One of the more commonly requested file exports for websites, this XMod Pro Feed format allows you to create a Microsoft Word DOCX file in XML-based code. Another consideration when working with data and records in XMod Pro is the ability to use XMod Pro Feeds to produce "printer-friendly pages" that are rendered outside of the main DNN site/skin, and can contain different print css and code and layout/formatting. With the XMod Pro Feed, creating an RSS feed of your DotNetNuke data or custom database records is incredibly easy. Simply choose your formatting and within minutes it is setup and your users can subscribe to instant updates on records, articles and more. The Media RSS (MRSS) is a variation of RSS feed which allows for easy syndication of media files such as audio, video, and image lists. The MRSS format allows for more details and information specific to image groupings, galleries and playlist-type feeds than standard RSS. This format uses the Yahoo! Media RSS format and can be used to create feeds for image galleries and more. The core, essential XML formatted export, this XMod Pro Feed can be used to create extensibile data exports for transfer and use with other systems in a universal format and data structure. The SMIL (Synchronised Multimedia Integration Language) server-side playlist format allows you to specify the order of media, start/end points and more. This playlist type is supported by many major streaming providers such as Windows Media Streaming Server, Real and QuickTime. There are many playlist and media list formats around. The ASX (Advanced Stream Redirector) media list is an XML-based Windows Media metafile / playslits that is used to link videos/media streamed from a Windows Media Streaming Server. Thes files commonly have a .WVX, .WAX, or .ASX file extension.